The Management Portal is a central website that administrators can use to view and manage network status. 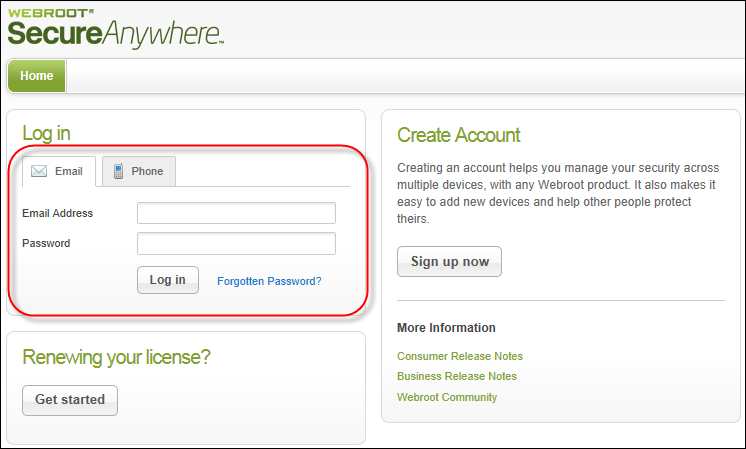 The administrator who first created the Webroot account has access to all functions in the portal (see Creating a Webroot account). If desired, the administrator can create additional users with full or limited access (see Managing portal users). In the Log in panel, enter the email address and password you specified when you created an account. Click Log in. Note: Hikari Tushin users can click the Phone tab to log in using their phone numbers and passwords. The Phone tab is visible to all users, but non-Hikari Tushin users should continue to login using their email and password. 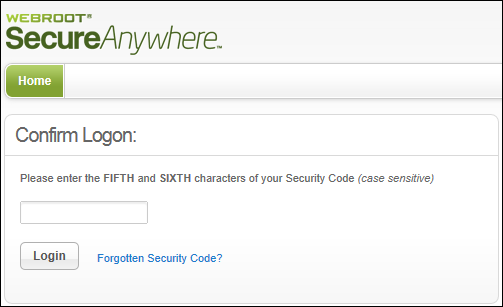 In the Confirm Logon panel, enter the requested characters of your security code and click Login. You defined your personal security code when you created a Webroot account. Each time you log in, Endpoint Protection will require this extra security step, and will prompt for two random characters of your code. For example, if your code is 123456 and it prompts you for the fourth and sixth characters, you would enter 4 and 6. The SecureAnywhere website opens and shows the total number of endpoints protected in your network, any endpoints that have threats, and any endpoints with threats detected in the last 24 hours. From the Endpoint Protection panel, click Go to Endpoint Protection to open the Management Portal or click an Endpoint Infected link, if any, to open the Management Portal and go directly to the threat information panel. The Management Portal displays. The Status panel includes threat alerts, endpoint activity, and data charts. Click the tabs along the top row to access configuration and other tasks. The following sections describe the areas of the Management Portal, including its tabs, menus, panels, tables, search functions, and export functions. The following table describes the Endpoint Protection tabs. An alert notification panel, if endpoints need attention. Click the notification to see a list of endpoints that encountered threats. A bar chart showing the number of endpoints that encountered threats in the last 7 days. A pie chart showing the SecureAnywhere versions installed on your endpoints. 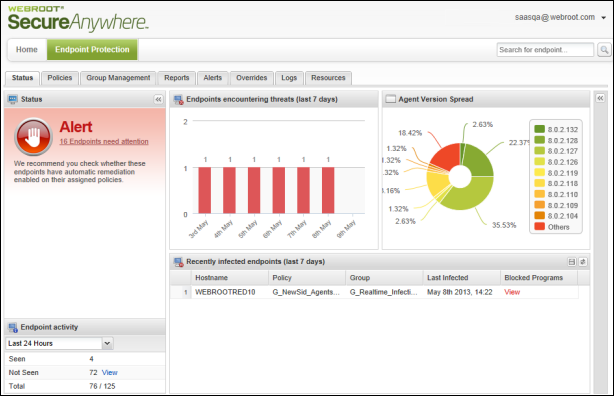 An endpoint activity panel showing the number of endpoints reporting into the Management Portal (based on a timeframe you select). If any endpoints have not reported their status recently, you can click the View link next to Not Seen to determine which endpoints are not reporting status. A panel showing the endpoints with the most recent threats.You can click on a row to view more information and add an override, if desired. Policies Policies define the behavior of SecureAnywhere on the endpoints, such as when it runs a scan and how it blocks potential threats. Group Management Groups help you organize endpoints for easy management. You can view your groups and each endpoint in the group. You can also select individual endpoints to see their scan histories. Reports Reports show threats and unidentified software present on your endpoints, as well as the versions of SecureAnywhere they are running. Alerts Alerts allow you to customize warnings and status messages for a distribution list of administrators. Overrides Overrides provide administrative control over the files running in your environment. You can override files so they are not blocked or always quarantined. Logs Logs provide a view of changes and a history of command usage. Resources Resources provides information on deployment options for endpoints. The arrow next to your login ID opens the menu for Endpoint Protection. The options available on the menu vary, depending on your access permissions. See the following table for more information about the Endpoint Protection Menu. Account Settings Edit your account settings, including your password and other information. See Editing your own account settings. Manage Users Provide other users with access to the Management Portal. See Managing portal users. Manage Keycodes View your current Endpoint Protection license keycodes and add more to the portal, if you purchased additional keycodes. See Adding keycodes to your account. Downloads Download the SecureAnywhere installer file and read more about deployment options. Help Open the online instructions for the Management Portal. Support Open the interactive knowledgebase to find product information. Logout Exit out of the Management Portal. For a larger view of the data charts, you can collapse the panels on the far left and the far right. Click the Collapse buttons (shown in the following example). The bar charts in the middle panel are static; you cannot collapse them or change the type of charts that display. To re-open the panel, click the Collapse button again, as shown in the following example. When you see a spreadsheet icon, you can click that icon to export the displayed data into a spreadsheet. When you see a television icon (shown in the following example), you can click that icon to view a video that describes a procedure related to the panel. When you see a Question mark icon, you can click that icon to open Help for the current panel.